Now begins the least introspective post to date. 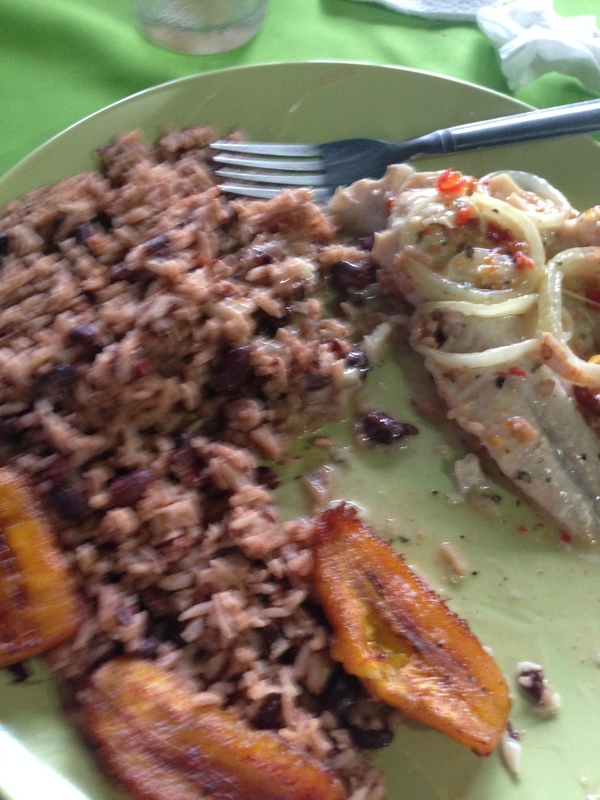 I will talk about myself sparingly and will tell you about Costa Rican (“CR”) food instead. The Gringos (people in CR from the USA) I met during my first weeks here told me food is sub-par. Now that I have tried different food in this country, I half-heartedly disagree. Affordable fine-dining and decent cheeseburgers are more difficult to locate in CR than in the USA. 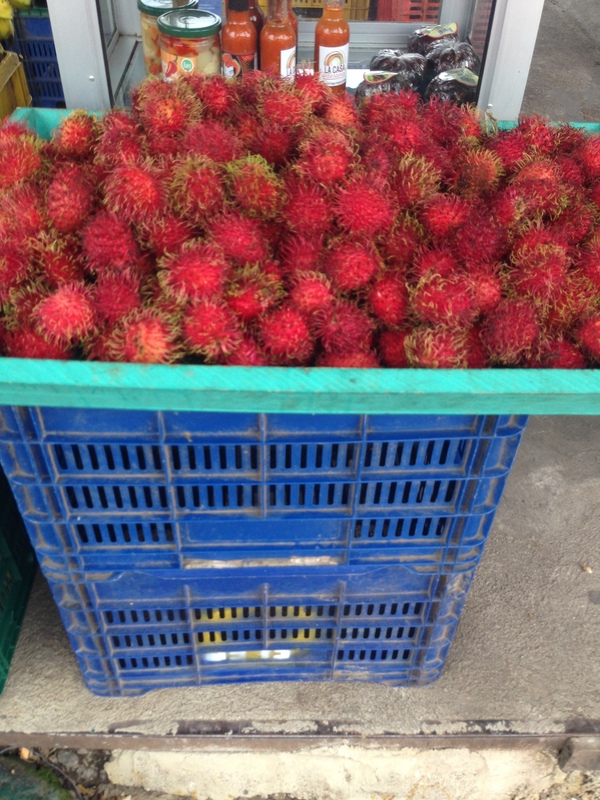 However, exotic, uniquely-satisfying fruits and vegetables are incredibly inexpensive and discoverable here. 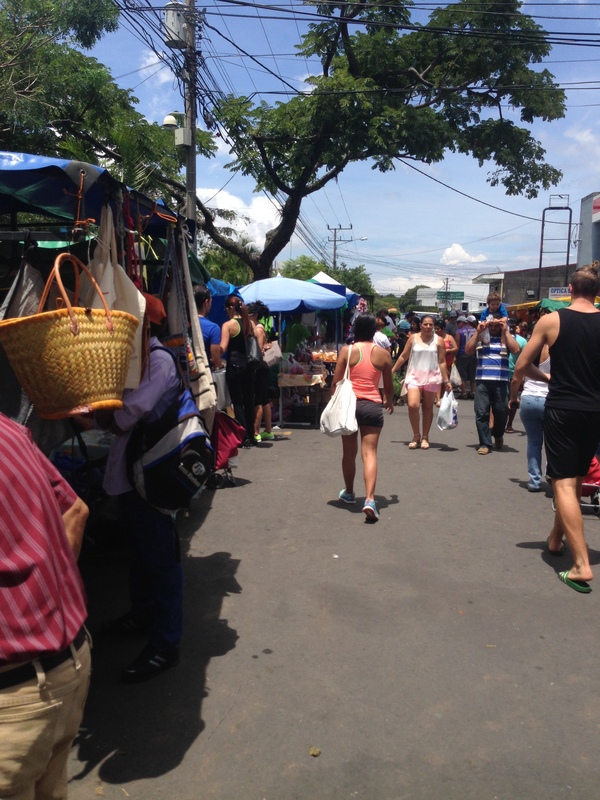 One trip to “La Feria” or weekly local farmers market (pictured) will help you understand. Other than individual fruits and vegetables, the native Costa Rican meals are usually more sensible than they are anything else. They serve their intended purpose for casual lunches and dinners out. 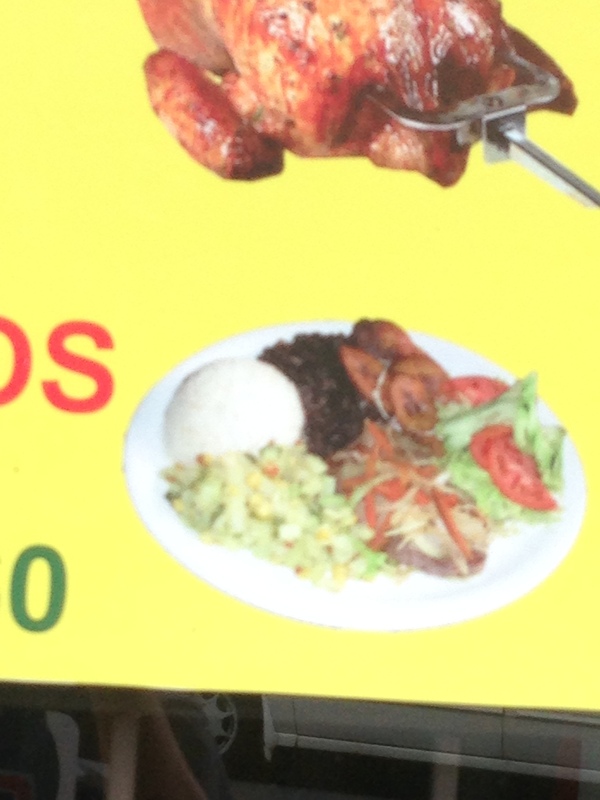 Ticos (Costa Ricans) do well with what they have here. This is the every meal of Costa Rica. Casado translates to “married man” and the meal is nicknamed “The Married Man’s Lunch.” It always includes: rice; black beans; salad; plantains; tortillas, and an optional entrée of chicken; beef; fish; or pork. It is a well-balanced lunch and features the right amount of sweet and savory tastes. Although no two Casados are exactly the same, all the ones I have eaten were satisfying. 2. Gallo Pinto–This is the child or “el Nino” of the Casado. Gallo Pinto’s two main ingredients are black beans and rice and it is usually eaten for breakfast alongside eggs and bread. I love bacon, so my first Gallo Pinto encounter included me asking the waitress, in broken Spanish, where my bacon was. I quickly learned that Gallo Pinto goes in place of the bacon. Before you go disowning me, I still like bacon and will continue eating it, but beans and rice for breakfast works too. Nutritionally, it makes sense to eat beans (protein and fiber) and rice (carbohydrates) in the morning. Gallo Pinto is as good as the cook who makes it. It is difficult to screw up, but difficult to make exceptionally. I plan on making and eating it for breakfast long after my time in CR is up. This fruit starts the part of this post about food in CR that you don’t normally find in the USA. On the surface, these don’t look like something you should put in your mouth. That thorny looking part is the peel. Inside is a pear-colored, peach-textured fruit with a large seed in its core. Each mamone gives you a few bites and a shade under 50 calories, but it does the trick when an apple is too much. 4. Mangoes Everyone loves mangoes and rightfully so. During summer months, they are everywhere in CR. 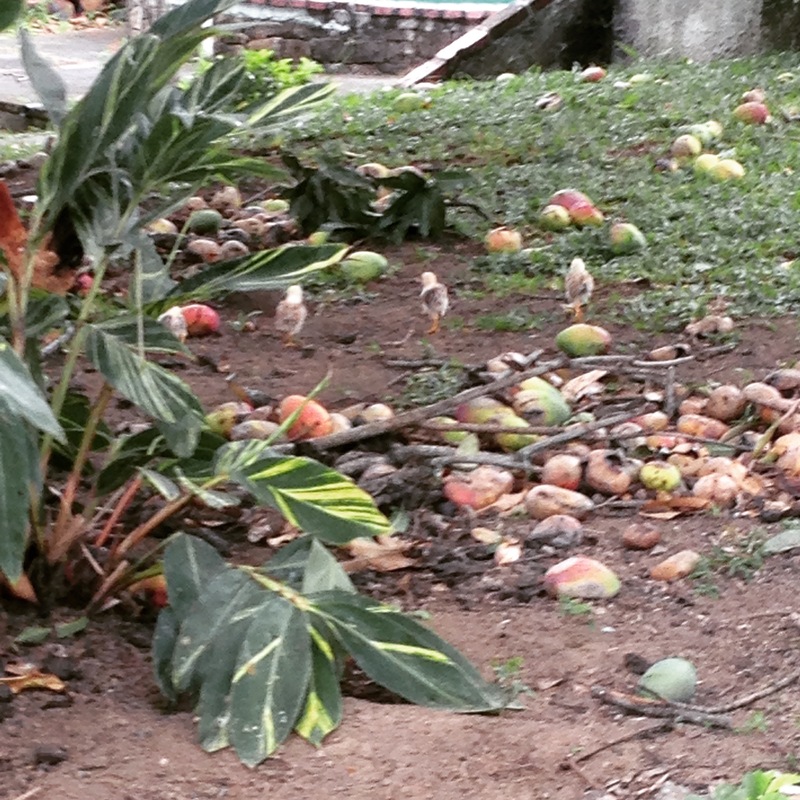 It practically rains mangoes during that time. They grow and then fall from the trees in huge numbers until stopping, quite abruptly, in late August. Previous to moving here, I had only eaten pre-cut mangoes out of a plastic container from the grocery store. Here, I have had the pleasure of peeling and eating them myself. They are far sweeter and tastier here, but I have contemplated showering after every time I have peeled and eaten them. They are incredibly messy. The juice gets on your hands, and even arms, and the solid part gets in your teeth. There was no reason for my orthodontist to caution me against eating mangoes when I got braces, but they probably do that here. That being said, if you don’t like mangoes, I don’t care about you. This is the most satisfying drink I have had here or maybe anywhere. Hard to describe, it reminds me of a less acidic grapefruit juice with the sweetness of a sugary, green grape. If you come here, drink it. Do it. 6. Nispero–These cherry-sized, peel-covered morsels taste great. While the fruit part gets a high grade, each one yields a very small amount of food after a bit of work. It has a peel, which usually comes off with some of the fruit. In the middle are two seeds which make up 2/3 of the fruit’s mass. If I had the time and know-how, I would genetically engineer a larger nispero. They are tasty, but small. 7. 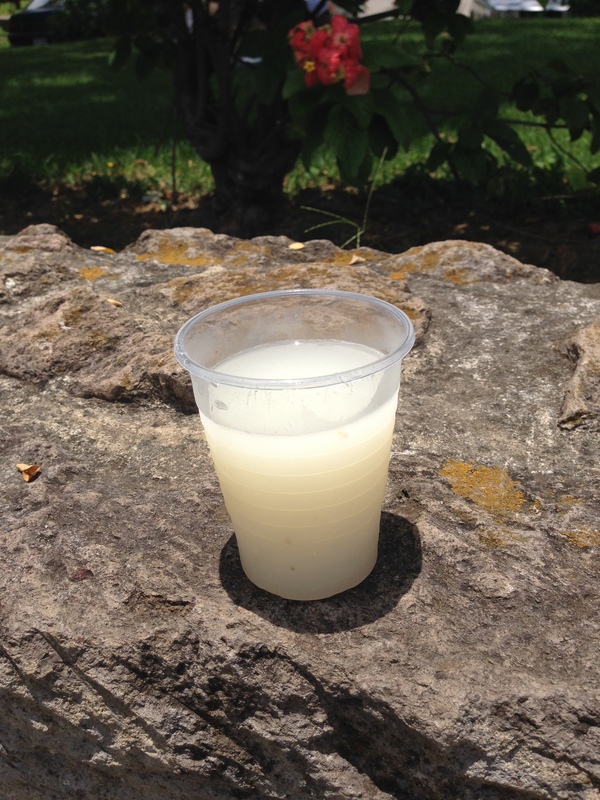 Agua Dulce–In USA, we joke about children’s drinks being sugar water, which has negative connotations. Agua dulce is literally cane-sugar water. Its lack of high-fructose corn syrup and artificial flavoring distinguishes it from the obesity inducing “sugar water” drinks in the USA. Agua dulce is usually consumed after dinner to ease digestion and, importantly, it doesn’t keep you up all night. It is an effective non-alcoholic nightcap. I really like it. 8. Ants–Yep, the insects. Either they are impossible to corral or effective extermination is tougher to obtain in CR. There are more ants crawling around food in the kitchens of houses I have stayed in here than in those of which I have stayed in back home and I’m not slumming it. You don’t even have to spill anything. What I am talking about does not rise to the level of an infestation, but small groups of ants show up in clean areas of houses very often. Therefore, I confess to probably having eaten some ants. I have not knowingly, willfully eaten any, but have knowingly, willfully eaten food, which was surrounded by ants shortly before I did it. I am fine though. I consider my CR food expertise a work in progress, so this is likely the first of numerous posts on the subject. The most satisfying experience of my time in Costa Rica came, unexpectedly, this past Saturday. It was not on a mountaintop, beach, zip line or in a rainforest. I did not pay more than $10 for a fruity rum drink while sitting by a resort pool surrounded by English-speaking vacationers. 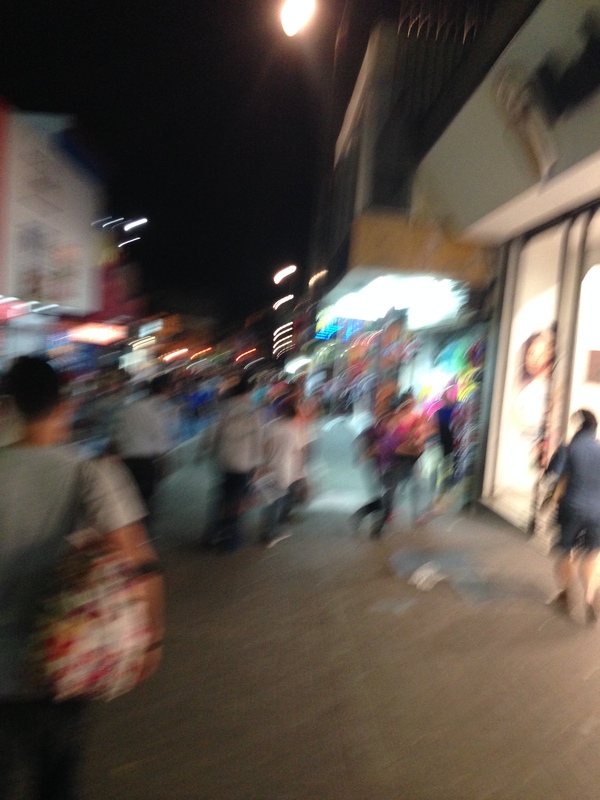 To the contrary, I spent less than a dollar for the bus fare and took one picture–not a selfie (see above). My day out began in a stereotypical North American way at a North American-themed place called “Mac’s American Bar.” I went there to watch college football. It was as close as possible to exactly what I would be doing at home. It was fun, but is not the “satisfying” experience I wanted. After the game, I had the choice of easing into the evening back in suburban San Jose or walking the less predictable streets of downtown with a new friend. I chose the latter. Downtown San Jose is not boasted about by the locals for good reason. Far more crime, drugs, and that which goes along with them exists there. The streets are inconsistently lit and the buildings crowd the streets sandwiching pedestrians into small sidewalks. The underside of Costa Rica is there in full force. It simultaneous displays where San Jose was and where it is going. I wanted to and got to see both. There were safe and unsafe places; hard-drug users and well-manicured locals; prostitutes and police officers; clean buildings and decrepit buildings; cracked streets and smooth-paved roads; pushy vendors and inviting store fronts; fancy restaurants and unsavory food establishments; and very little in between. I found it all fascinating. As a mere spectator to all of it, I felt satisfied enough to call it a night around 8:30 pm. This is my way of travelling. Actually, I contend it is more properly entitled, ‘experiencing.’ I came here to experience life in a different country, as it is, but not as I want it to be or think it should be. My objective is different. I want to see everything here and ask why. I am spoiled, but have previous experiences from the United States, which taught me that. So, while a reminder of how lucky I am was an ancillary benefit of my time downtown, it was not the primary benefit. Simply put, I am here to grow. Adventures like mine on Saturday night accomplish that. I wanted to experience San Jose as it is and I did. That is why I came here.